The development team of Katy Boardwalk District has announced plans for a new lakefront destination to serve as a hub for entertainment, community and culture anchored by the area's first full-service conference center hotel, first-to-market entertainment concepts, luxury loft residences and an impressive 90-acre nature preserve showcasing the region's native trees, flora and wildlife. The announcement follows the Katy Development Authority's recommendation to enter into a master development agreement with developer KBH Venture to bring a full-service, four-star conference center hotel to the 169-acre setting at Kingsland Boulevard and Katy Fort Bend Road just south of I-10. "The entire project is about creating something unexpected — truly a natural-suburban oasis," said Kayce Reina, director of tourism and marketing of the city of Katy. The master development agreement calls for a full-service conference center hotel with a minimum of 300 rooms, a specialty restaurant, bar, pool and fitness center as recommended by Benchmark Global Hospitality, the international hospitality management company which will operate the hotel. The master development agreement also calls for a conference center of at least 43,000 sq. ft. The conference center hotel, designed by Gensler and built by Houston-based KDW, is expected to open fall 2021 with construction beginning in the fall of 2019. The hotel's brand is expected to be announced in early 2019. 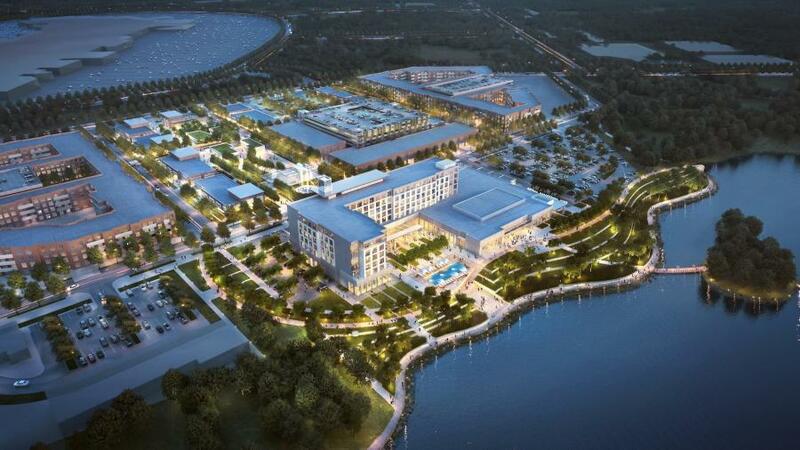 Members of the Katy Boardwalk District development team said they are in advanced discussions with a leading global hospitality company, noting the opening of the area's first full-service conference center hotel will be a major game-changer for Katy. Katy Boardwalk District's residential component, Lofts at Katy Boardwalk, will feature 319 loft-style luxury residences with two resort-style pools, state-of-the-art fitness center, resident lounge, business center, outdoor cabanas and grilling areas and onsite management. Ideal for working professionals, nearly all residences in phase one will be one or two-bedroom floorplans. "Our sense is these loft-style residences will be very well received among working professionals seeking a new, highly-amenitized home in these types of mixed-used settings," said Ray Gabriele, vice president of real estate development of Sueba USA Corporation. Sueba Construction Inc. plans to break ground on the first phase of the Lofts at Katy Boardwalk in January 2019 with an expected completion by spring 2020. The residences will be designed by Sueba Consulting Inc. and managed by Southampton Management Inc.
Katy Boardwalk District also will feature approximately 155,000 sq. ft. of retail space, with an emphasis on restaurant, bar and entertainment concepts, along with 60,000 sq. ft. of Class A office space, all designed by Gensler. Construction on the retail phase is expected to begin by late 2019 with leasing for the project's retail and entertainment phases currently underway represented by Lacee Jacobs of CBRE. Jacobs said Katy Boardwalk District's retail and office will surround more than an acre of public green space designed for outdoor activities and events. "Between the hotel, retail, office and residential, our goal is to cultivate an active, vibrant setting at all times," said Keith Dalton, president/CEO of KDW. Dalton also was among the group which brought the Typhoon Texas waterpark to Katy. Katy Boardwalk District's lake and nature preserve features two miles of walking paths, wooden boardwalks and other pedestrian-friendly pathways, ideal for residents and visitors to Katy Boardwalk District. For more information, visit www.katyboardwalkdistrict.com.